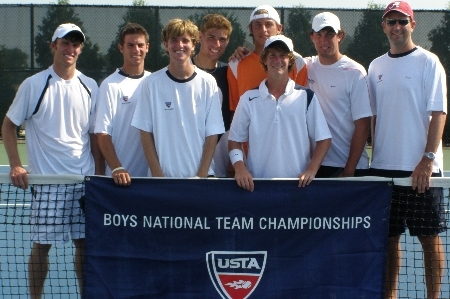 The final day of the USTA National Boys 18 Team Championships looked very much like last year. It was hot and humid, everything ran smoothly, and Southern California (above) played Southern in the finals. There was no doubt during this week that all of the teams were "stacked" with the top players in the country so I expected a close final and it couldn't have gotten much closer than this. After Southern California took the doubles point -- despite a rocky start -- Bo Seal evened it up when he took out Boshidar Katsarov. It wasn't long before Devin Britton survived a tiebreaker and a close second set over Nicolas Meister to give Southern (above) the 2-1 lead. And from there the roller coaster just continued. The power struggle at No. 1 ended with Ryan Thacher over Houston Barrick, and the score at 2-2, but Bradley Klahn soon had the Southern Cal lead after a back and forth match of great points with Eric Quigley. And then there were two. Just the bottom courts were left and they were both in third sets. First to finish was Ahmed Ismail, who tied the score back up again when he took out Ryan Lipman. There was a crowd of players from all teams turning to Court 6 where Steve Johnson and Tyler Davis had played through two close sets. Despite pulling out a breaker in the second with exhilaration, Tyler seemed to run out of steam in the third and Steve took it for Southern California. It was their fourth consecutive championship. Midwest (above) enjoyed a home section win for Third Place with a 5-2 victory over Florida (below). I caught the end as Joey Burkhardt and Evan King continued their contest long after the match had been decided into an exciting 10-8 breaker for the third for Florida's Joey. In a tight Fifth Place playoff, Texas won over Eastern 4-3 after George Laffey was forced to retire in the third with leg cramps in his match against Jonathan Alexander. Erik Hannah of the Florida section was given the tournament's Sportsmanship Award. Once again Tournament Directors Jim Tressler & Alex Voss (pictured right with Erik Hannah) did an incredible job keeping the three sites running like clockwork, as did the staff at the Atkins Tennis Center. The players were especially grateful to the trainers, who kept them hydrated and were always on hand when needed. I bid farewell to my Illini friends as I head off to the girls' event in California!